Caucasus and Transkaukasus to mountain in northwest Iran. 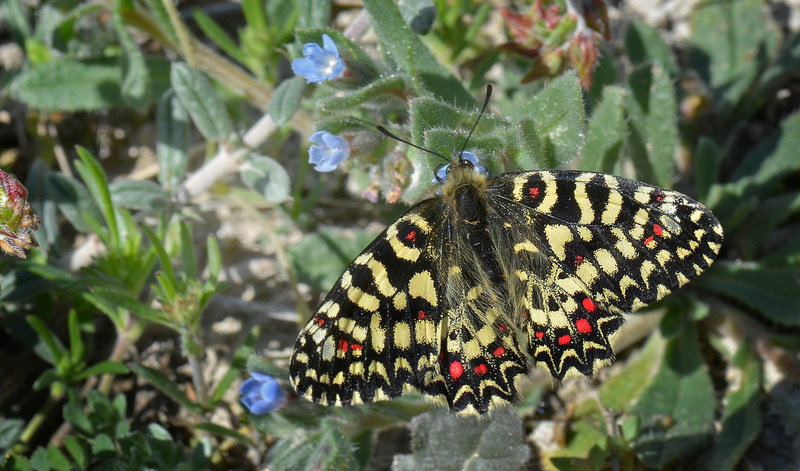 Western Palaeartic zone is approximately 772 species of butterflies. Novosibirsk, Altai, Tomsk, Krasnoyarsk, Tuva, Irkutsk, Yakutia, Amur, Khabarovsk, Usseri, Sakhalin, Magadan, Kamchatka and Chukotka in the east. And to the south, it is countries like Kazakhstan, Uzbekistan, Turkmenistan, Tajikistan, Kyrgyzstan, Mongolia. Himalayan: (Jammu & Kashmir, Ladakh, Himachal Pradesh, Uttarakhand, Nepal, Sikkim, Bhutan & Arunachal Pradesh). Tibet. Tian Shan, Qinghai, Gansu and Manchuria in the western and northern China, Korea and Japan. Palaeartic zone is approximately 1500 - 1600 species of butterflies. Where shown on this page 383 species. which can be read on Lepiforum.de which is among the first to bring corrections on their side after ICZN decisions. Small Apollo Parnassius sacerdos. Alps, Ural, Sibirien, Mongolia, Alaska.